Private, classic Bodrum village house & private pool. View of hills and Aegean Sea. This village house is of traditional stone, with 50 cm (20 inch) thick walls and built mid-20th century. It is located near the Bodrum village of Yalikavak and less than 20 minutes to Bodrum city. Standing high and above the other houses in the village allows fabulous views of the mountains, the sea, plus the harbour and marina of Yalikavak. The sunset is unobstructed and superb. The location on the North side of the Peninsula affords cool breezes. The house has an extensive veranda/patio where one can relax or have a slow meal while taking in the views. Entering the house, to the left, is the Living Room with 'L' shaped traditional, 60cm, padded, village seating. A small child can sleep here. The kitchenette adjoins. To the right, is the master bedroom. From the master bedroom you enter a small dressing room that leads to the bathroom. We have accommodated more than 2 persons, at this house, many times. The patio is covered and we can place on the patio metal cot beds with comfortable mattresses for mature children. Original artwork and antiques throughout. This is a house to use as a base for exploring the area around Bodrum or for simply relaxing. The property is located high above the village of Gokcobel. 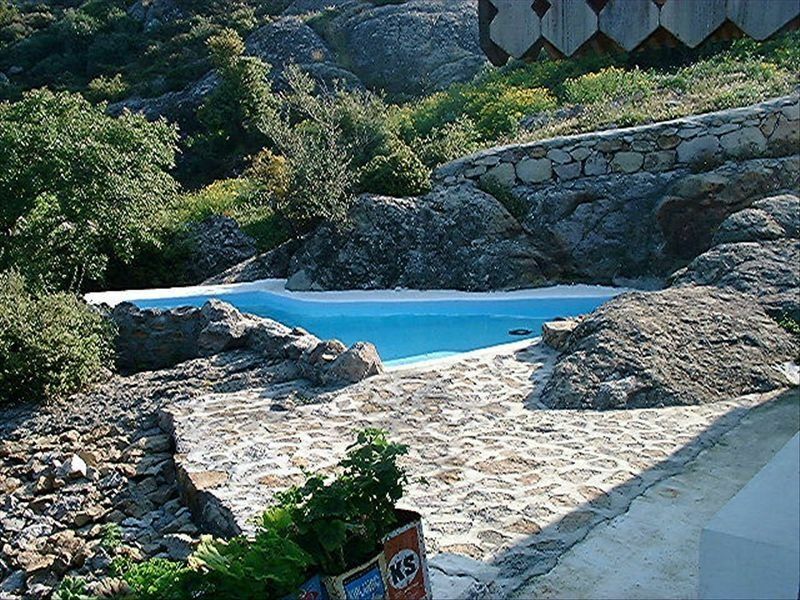 The house is a 40 minute drive to the airport and the village of Yalikavak is 3 km away. Major supermarkets (6) are within a few hundred meters of the house. There is a private road to the property with a private entrance to the house. This is a stand-alone property and not part of any apartment type complex. WE ALSO HAVE ANOTHER SMALL (economical) VERY PRIVATE COTTAGE WITH PRIVATE POOL LOCATED ON A BEAUTIFUL VINEYARD. WEEKLY RENTAL IS ONLY $595. PLEASE EMAIL FOR ADDITIONAL INFORMATION. could not help buying this 20 years ago. Good view, private and a real home. If you are looking to stay in a "real" village house then you have found it. not for actual use. It is the original fireplace and never used. yes we provide all towels for the village house. Beach towels NOT provided but instead we provide pestimal towels or Turkish cotton hamam towels that can be used at the beach. Thank you so much for this great review. You are right, of course, that we have tried to keep this house as authentic as possible but with all basic comforts. We realize that not everyone is looking for a true cultural experience and that is why most modern hotels with their MacDonald style rooms do so well. Those that do not seek such accomodation, will love the atmosphere and views of our Village House. Thank you for staying with us. My husband and I stayed at the Village Cottage for two weeks this summer. We were looking for something authentic that wasn't part of a condo complex or resort, and the Village Cottage met our needs. The cottage is a short drive from Yalikavak, which has a terrific Thursday market and a number of shops and restaurants, and is walking distance from a Migros supermarket. There is a rustic kitchen with a hot plate and a small hibachi grill, and we made most of our meals at the house, on the lovely wraparound porch with sunset views. Frank was a generous host who helped with making some restaurant reservations and answering questions about the area. All in all, we loved this quiet, laid-back part of the Northern Peninsula and look forward to coming back. Thanks for the lovely review. I am really happy you enjoyed your stay. We decide that we are going to revamp the kitchen for 2014. Still rustic style, but a kitchen that will work better with a larger fridge and perhaps a stove with oven and better storage spaces. Of course it will continue to have a toaster, coffee maker, sandwidge grill and I will see if I can add a microwave unit. Again, thanks for coming and hope to see you again one day. When searching through the internet for a villa, I was immediately struck by this property as something different, out of the ordinary, quirky, and that is how it turned out. The cottage is an older building with thick stone walls which sits nestled on a mountainside overlooking the village of Yalikavak- it is furnished with antiques and curios from the local area- so different from the sterile decor of modern apartments. The rooms are quite small but were perfect for us as a couple. The location up a steep hill means a car is essential but Frank arranged that for us and we were picked up at the airport and driven to the house, avoiding the stress of finding the place. We were greeted by the owners property manager with smiles, flowers, food and home-made wine! The generous patio area is covered to provide shade throughout the day and we ate outside morning, noon and night. The pool is small- more for a quick plunge than a swim, but the view from the pool is fabulous as are the sunsets every evening. There are four supermarkets just down the hill on the main road, so food shopping was easy- local markets are the place to buy your fresh fruit and veg and there seemed to be one almost every day in the towns and villages around us. Frank, the owner came to visit us and was very knowledgable and helpful with tips about the local markets and restaurants- he has provided a useful booklet in the house. The location of the cottage is about 5-10 minutes drive from the seaside town of Yalikavak, It is a pleasant busy little town with many seafront retaurants, bars and a weekly market. It has a public beach which you can use but we found it easier to visit one of the many waterfront bar/restaurants with bathing pontoons situated to the west of the new Marina. We did quite a lot of sightseeing trips and there are many fascinating archaeological sights within easy reach. Also Bodrum town is definitely worth a visit to see the castle and underwater archaeology museum. Our most outstanding meal had to be an evening at Limon cafe on the coast road towards Gumusluk- you need to book and it's not cheap, but the food and the setting is breathtaking. I would recommend this property to people who are independently minded and looking for a taste of real Turkey, we did quite a lot of travelling around during our stay and its but equally you could just chill by the pool and read books. The property is charming and original and suited us well and the owner was the perfect host. What a great review! We could not ask for more. The Village House, with its views and cool breezes is a wonderful surprise that many do not anticipate when they book. We are so happy you liked the house and if you ever have the chance to return we would be delighted. Not many words needed to describe the stay at the villa house. It was just great! Frank (the owner) is a nice guy who will drop in occasionally. The house is basic, yet has everything you could possibly need, nice pool, supermarket nearby and great views. We stayed in allmost every night, why go out when you're in a perfect spot? We'll definately be comming back to this spot in the near future. Lovely secluded property set at the back of the village for privacy. Amazing views and wonderful sunsets! Wake up to chickens scratching in your back garden. Perfect place to relax and have a BBQ at the end of a busy day and the owners are very hospitable with a mine of information on different things to do in the area. We found it very easy to access everything (with a hire car) and near to restaurants, beaches and a short drive to Bodrum. Would recommend. This Is A Great Getaway! My wife and I had a great time at this cottage which we rented from Frank Marciano. It is a great getaway and I highly recommend it to any couple who want to spend a quiet time together. And Frank is a great host, the bottle of wine and breakfast platter were nice to find on arrival. We will be back, Frank! Terms for payments made. Cancellation before 60 days of reservation: Total funds paid will be refunded, less $100 service charge. Cancellation less than 60 days before arrival: Total funds, or partial funds paid, will be refunded, only if owner is able to re-book all, or a portion, of the cancelled dates. A $100 service charge will also apply. Refunds will be made through Paypal.